Find short term van insurance when renting a van. If your van rental does not include insurance we offer some options. Licence holders from the UK, EU/EEA, Switzerland and Commonwealth countries covered. In most circumstances if you rent a van you find that insurance, in the form of a Collision Damage Waiver and Liability Insurance is packaged into your hire - but what if it isn't? Some van hire companies, particularly those who focus on the trade market, expect the hirer to provide their own insurance and if you already own a van this will probably not be a problem. However, if you don't, who will insure rented vans on a short term basis? 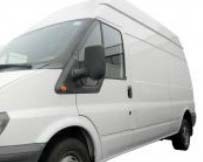 Insure Daily offer instant comprehensive short term van insurance policies for driving a van from 1 day up to 28 days, and, unlike other similar insurers, they can also cover hired vehicles. These are subject though to a higher excess in the case of accident or theft. Drivers need to be aged between 21 and 75 (although this can differ depending on the van make and model. If you cannot find insurance to cover your rented van, you might need to either try to persuade your van hire company to provide the cover for you or alternatively try a company who do offer insurance within the rental deal. If you are successful down either of these routes don't forget - before you pay for expensive excess insurance at the Van Rental station - we also offer that cheaper through our Van Hire Excess Insurance comparison service.